Whether you’re pretty much a wedding pro or you’re a total novice, it’s best to brush up on the unspoken guest code of conduct. Read on for eight rules you’ve got to follow as you hit the fall wedding circuit. 1. Don’t bring an uninvited plus one. If you didn’t receive a plus one — if you did, it will say “and Guest” on the outer or inner wedding invitation envelope — that means you’ll be going solo for the evening (and yes, this is non-negotiable). The envelope should also specify if your significant other or children are invited to the big day. 2. Do show up to the wedding on time. Don’t be tardy for the party! If transportation is being provided, arrive at the designated pick-up spot with time to spare (transportation details should be included in your invitation, on the website, or at the hotel). And if you’re driving, give yourself enough of a cushion to account for wrong turns and traffic. Showing up late is distracting, and may interfere with the processional or photos. 3. Don’t wear white. Out of respect for the bride, don’t wear a white or cream dress unless you’ve been explicitly asked to. Also on the do not wear list? Anything too revealing or casual (i.e., something you’d wear to the club, the pool, or the gym…). 5. Don’t text during the ceremony. The happy couple wants to see your smiling face! Restrain from texting, Instagramming, Facebooking and the like during the ceremony. It’s usually only about 30 minutes. 6. Don’t post photos of the bride before the ceremony even starts. Unless the bride has given you the green light, it’s common courtesy to wait until after the ceremony to post. You don’t want to spoil the surprise (plus, some traditional couples choose not to see each other before the vows). 7. Don’t bring an oversized gift with you to the reception. Of course, the couple will be grateful for your gift no matter what. But it’s best to mail larger gifts instead of bringing them to the reception, so they don’t need to be transported home. 8. Don’t drink too much. Enjoy the open bar, but don’t get so sloshed that you’re dancing on the table, yelling obscenities, or making a total fool of yourself. 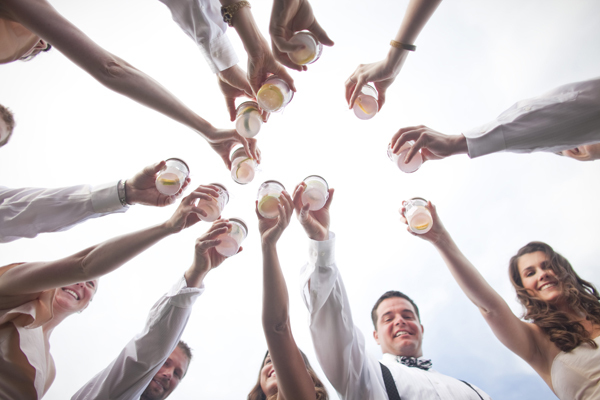 Let the newlyweds be the life of the party! Looking for more advice on how to be a rockstar wedding guest?